-Try your best not to hold the tooth by the root, as there are very delicate cells along the root surface which are critical to successfully reattaching the root to the socket bone. You don’t want to damage these, so try to touch only the “crown” of the tooth – that “whiter”part of the tooth that you would see when you smile. -Don’t scrub it ! Instead, gently rinse off any debris with water. Always handle the tooth gently and minimally. -If you can, place the tooth gently back into its socket temporarily. 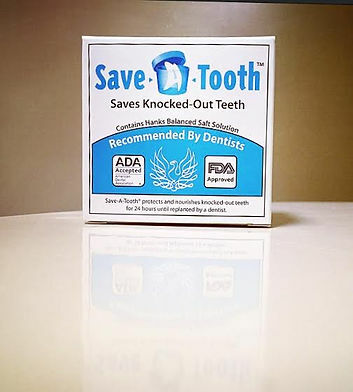 If not, then the next best is to place the tooth into Hanks Solution, which you can get here or at your drugstore and have ready in your first – aid kit. Next best would be to place it in the mouth between your cheek and gum or in contact-lens saline solution, or milk. In summary, keep the tooth moist, handle it gently, and get treatment quickly! In summary, keep the tooth moist, handle it gently, and get to our West Caldwell dentist office quickly!